Baishizhou Superhero has been installed at Handshake 302. Come and see and play with the first urban village superhero photo stand-in! Below, the curatorial statement for the installation. Superheroes navigate the debris of urban despair, haunting the rubbished alleyways and crumbling staircases that lead to cramped spaces at the end of unlit hallways. They appear as exaggerated silhouettes or bursts of neon light. They leap over tall buildings in a single bound and rescue the victims of unfettered greed and malignant desire. Most importantly, superheroes represent the fantasy of latent potential and unlimited transformation in these techno-modernized times; mild-mannered, nerdy and bureaucratically inclined Clark Kent steps into a telephone booth and strides out a decisively manly man, who rights systemic wrongs through physical prowess. Hooray! In the installation Baishizhou Superhero, Liu Wei’s playful cartoon characters transform Handshake 302 into a magic telephone booth. Visitors step into the space and through the power of a photo stand in become one of seven possible urban village superheroes – Methane Man, Wonder Granny, Stir Fry Fly, the Amazing Beer Babe, Village Guardian, Super Dog, or Cat-a-go-go. Friends can then take pictures of each other as they model the most common social roles in any of Shenzhen’s urban villages. At first glance, the installation seems a tacky party game until we remember that these social roles – deliveryman, child care provider, food hawker, beer waitress, and village fireman – are the vehicles through which migrant workers transform their lives. Each migrant worker undergoes the sometimes exhilarating and often bizarre transmogrification from ordinary peasant to urbanite. 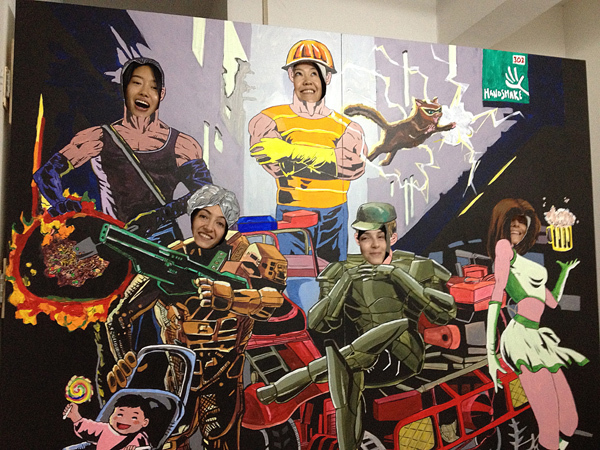 However, the Baishizhou Superheroes also sustain Shenzhen’s economic boomtimes. After all, these superheroes provide the services and social network that Shenzhen’s factory workers need to make themselves at home in the city. At second glance, the insidious charm of the installation becomes even more apparent. There is no doubt that human beings have latent potential to transform ourselves and our lives. The Shenzhen Dream hinges on this fact and migrants come to the city in order to improve their material lives. Within the maelstrom of globalization, however, the latent potential of human beings to transform ourselves has been limited by the necessity to commodify ourselves. The super power of an unpaid grandmother, for example, is to create value by providing unpaid childcare so that both fathers and mothers can join the gendered labor force, as deliverymen or waitresses. The “super power” of all Baishizhou migrants is, in fact, the power to sell their labor on an unregulated market for as long as their bodies hold out. A popular expression maintains that migrant workers “sell their youth”. As individuals, there are limits to the scale of transformation. When a deliveryman’s legs can no longer pump a bicycle or when a waitress’ breasts succumb to gravity, these workers are replaced by younger, more energetic migrants. And there’s the fantastic allure of the superhero myth – unlimited strength to endure and transcend physically exhausting and emotionally alienating jobs. Hours: Weds 19:00-21:00; Sat & Sun 15:-17:00, or by appointment. Access: Baishizhou Subway Station Exit A, walk north to Jiangnan Baihuo Supermarket, make left down alley, follow to Shangbaishi Block 2 Building 49 (above the flip flop store). Ring bell and come up. This entry was posted in noted and tagged baishizhou, Baishizhou Superhero, czc special forces, handshake 302, migrant workers, public art, urban village. Bookmark the permalink. ← handshake 302 is on the map!